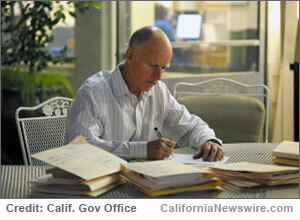 SACRAMENTO, Calif. /California Newswire/ –This week, Calif. Governor Edmund G. Brown Jr. announced the following appointments: First, Michael Martel, 62, of Rancho Murieta, has been appointed warden at the California Health Care Facility, Stockton, where he has been acting warden since August 2016 and served as chief deputy warden in 2016 and as a correctional lieutenant from 1990 to 1996. Martel served as retired annuitant chief deputy warden at the California Department of Corrections and Rehabilitation headquarters from 2012 to 2014, where he was an associate warden of reception centers in 2007, a lieutenant from 1998 to 2000 and a labor relations specialist from 1996 to 1998. He served as warden at San Quentin State Prison in 2011, where he was a correctional officer from 1981 to 1986. Martel served in several positions at Mule Creek State Prison from 2007 to 2011, including warden and chief deputy warden. He held several positions at California State Prison, Sacramento from 2000 to 2007, including associate warden, facility captain and correctional captain. Martel was a correctional sergeant at Folsom State Prison from 1986 to 1990. This position does not require Senate confirmation and the compensation is $145,440. Martel is a Republican. Cheryl McGray, 62, of Santa Maria, has been appointed to the 37th District Agricultural Association, Santa Maria Fairpark Board of Directors. McGray has been a teacher at Alamos Elementary School since 1993. She is treasurer for the Backcountry Horsemen of California Los Padres Unit and a member of the Alamos Parent Teacher Student Association and the Zeta Tau Alpha Fraternity. This position does not require Senate confirmation and there is no compensation. McGray is a Republican. Harold Gee, 49, of Arroyo Grande, has been appointed alternate member of the Commission on Correctional Peace Officer Standards and Training. Gee has been a correctional officer at California Men’s Colony, San Luis Obispo since 2002. He was a correctional officer at Salinas Valley State Prison from 1996 to 2002 and at Correctional Training Facility, Soledad in 1996. Gee was a loss prevention officer at Gottschalks from 1992 to 1995 and a volunteer reserve deputy sheriff at the Kern County Sheriff’s Office from 1992 to 1995. He was an investigative aide in the Kern County District Attorney’s Office from 1991 to 1995, a glazier at Aggson’s Glass Company from 1990 to 1991 and a sales representative at BA Valley Industrial Supply from 1989 to 1990. Gee served as a 2nd Class aviation electronics technician in the U.S. Navy from 1985 to 1989. This position does not require Senate confirmation and there is no compensation. Gee is a Libertarian. Patricia Cassady, 64, of Concord, has been appointed to the Board of Parole Hearings, where she has been a deputy commissioner since 2013. She was an associate chief deputy commissioner at the Board of Parole Hearings from 2005 to 2013, where she served as a deputy commissioner from 1995 to 2004. Cassady was owner and an attorney in the Law Offices of Patricia A. Cassady from 1988 to 1995. She earned a Juris Doctor degree from the John F. Kennedy University College of Law. This position requires Senate confirmation and the compensation is $142,095. Cassady is a Democrat. Troy Taira, 56, of Alameda, has been appointed to the Board of Parole Hearings, where he has been a deputy commissioner since 2015. Taira was special assistant inspector general in the California Office of the Inspector General from 2013 to 2015 and administrative law judge in the California Office of Administrative Hearings from 2012 to 2013 and 2009 to 2011. He was an administrative law judge at the California Department of Social Services from 2011 to 2012, staff counsel and prosecutor for the U.S. Coast Guard from 1992 to 2009 and a senior staff attorney at the U.S. Department of Homeland Security from 1992 to 2009. Taira was a defense attorney in the Fresno County Public Defender’s Office from 1991 to 1992. He served in the U.S. Navy Reserve from 1988 to 1992. Taira earned a Juris Doctor degree from the University of California, Davis School of Law. This position requires Senate confirmation and the compensation is $142,095. Taira is a Democrat. Daljit Bains, 44, of Sacramento, has been appointed deputy director of permit assistance in the Governor’s Office of Business and Economic Development. Bains has been owner and founder at Kaur Textiles since 2007. She was chief compliance officer at the Peace Corps from 2010 to 2015 and a regulatory compliance associate at Johnson and Johnson from 2005 to 2007, where she was an associate scientist from 2002 to 2005. Bains was a drug development associate at Genentech from 2000 to 2002. This position does not require Senate confirmation and the compensation is $110,004. Bains is a Democrat. Leslie McBride, 55, of Yuba City, has been appointed deputy director of the Real Estate Services Division at the California Department of General Services. McBride has been deputy director of business investment services at the Governor’s Office of Business and Economic Development since 2012. She was an independent consultant at McBride Group Real Estate Consulting from 2010 to 2012, chief executive officer at Keller Williams Yuba-Sutter Realty from 2009 to 2010 and mayor of Yuba City in 2009. McBride was project manager at Spieker Properties Inc. from 1997 to 1998, an independent realtor from 1994 to 1997 and an asset manager and construction manager at Sares Regis Group LLC from 1989 to 1994. This position does not require Senate confirmation and the compensation is $139,308. McBride is a Republican. Wm. Gregory Sawyer, 62, of Simi Valley, has been reappointed to the California Student Aid Commission, where he has served since 2013. Sawyer has been vice president of student affairs at California State University, Channel Islands since 2002. He was dean of student services at Florida Gulf Coast University from 1995 to 2001 and dean of students at the University of North Texas from 1990 to 1995. Sawyer is a member of the National Association of Student Personnel Administrators and the Association of College Personnel Administrators. He earned a Doctor of Philosophy degree in higher education administration from the University of North Texas and a Master of Arts degree in organizational communication behavior from Eastern New Mexico University. This position requires Senate confirmation and the compensation is a $100 per diem. Sawyer is a Democrat. Daniel Avegalio, 31, of Plumas Lake, has been appointed to the California State Rehabilitation Council. Avegalio has been a student services supervisor at the American River College Veterans Resource Center since 2016, where he has held several positions since 2010, including student personnel assistant, certifying official, work-study administrator, peer mentor and clerk. He was a squad leader at the U.S. Marine Corps from 2004 to 2009. Avegalio is co-chair of the MyVA Community Board of Greater Sacramento and a member of the American Legion, Veterans of Foreign Wars and Disabled American Veterans. He earned a Master of Science degree in vocational rehabilitation counseling from California State University, Sacramento. This position does not require Senate confirmation and there is no compensation. Avegalio is registered without party preference. Meriah Nichols, 43, of Petrolia, has been appointed to the California State Rehabilitation Council. Nichols has been a teacher for the Mattole Unified School District since 2016. She was an associate editor at Accessible Technology Coalition from 2010 to 2011 and program manager and founder of the WorkAbility IV at the University of California, Berkeley from 2003 to 2010. Nichols was employment and development coordinator, job developer and American living skills trainer at the International Institute of the East Bay in 2003 and a bilingual recruiter and program coordinator at Girl Friday from 2000 to 2001. She was a communications specialist at Phoenix Associates from 1999 to 2001, an English as a Second Language educator and curriculum designer at the English Studio from 1998 to 2001 and a training and development consultant at East-West Management Institute Inc. from 1996 to 2003. She was an English as a Second Language educator and teacher trainer at the New Era School from 1996 to 1997, a human resources manager at the University Cooperative Housing Association from 1995 to 1996 and a teacher at the School of the Nations from 1993 to 1995. She earned a Master of Arts degree in international and intercultural management from the School for International Training. This position does not require Senate confirmation and there is no compensation. Nichols is registered without party preference. Julie Austin, 61, of Oceanside, has been appointed to the California State Council on Developmental Disabilities. Austin has been a caregiver at In-Home Supportive Services since 2010 and an independent special education and disabilities advocate since 2001. She was director of the Sales and Marketing Division at Pacific Quartz Inc. from 2013 to 2015 and owner and manager at Brengle Terrace Animal Hospital from 1993 to 2004. Austin was regional sales manager for pet and veterinary supplies at Rolf C. Hagen Inc. from 1987 to 1991 and a regional sales manager for veterinary pharmaceuticals at Zoecon Industries from 1982 to 1987. This position does not require Senate confirmation and the compensation is $100 per diem. Austin is a Democrat. Craig Carter, 53, of Carlsbad, has been appointed to the State 9-1-1 Advisory Board. Carter has been police chief at the Escondido Police Department since 2013, where he has served in several positions since 1992, including lieutenant watch commander, detective lieutenant, captain, patrol watch commander and patrol sergeant. He has been an adjunct instructor at Palomar College since 1993. Carter is president of the San Diego Police Chiefs and Sheriffs Association and a member of the Alcohol Policy Panel of San Diego and the Palomar College Professional Development Advisory Board. He was co-chair of the Escondido Gang Reduction Intervention Program from 2010 to 2012 and chair of the Escondido Police Department Efficiency Committee from 2005 to 2012. This position does not require Senate confirmation and there is no compensation. Carter is a Republican.